Recent findings of science point to a massive human memory capacity. A 2004 Nobel Prize winning discovery pointed directly to neurons as the vehicle of memory. The memory for thousands of smells for animals resides in the combinatorial codes of their olfactory neurons. Combinatorial codes can theoretically store a galactic memory. The brilliance of the mind can only be explained by the presence of a massive memory. Just ordinary people were reported to be able to store, at a glance, billions of pixels of visual data. They could recognize, with 99.5% accuracy, any one of 10,000 images shown to them at one second intervals. Thousands of distinctive multi-million pixel classifications were swiftly absorbed and retained in the memories of their visual subsystems. Instinctual responses from millions of years of evolution have merged with new data of myriad images, sound bytes, tastes and smells into an incredibly detailed human memory. Pixel by pixel differences in these sensory images are recalled instantly. A Nobel Prize for research on receptor neurons. The olfactory system uses combinatorial codes. Normal people can differentiate between 1 trillion smells. The early "nosebrains" depended on combinatorial coding. The discovery of a "Bill Clinton Neuron." The arrival of neuronal communications. The nervous system can store "cubic miles" of bytes! Human memory exists all over the nervous system. The mind does not compute. It recognizes patterns. In 2004, a Nobel Prize acknowledged the discovery of researchers, who used calcium imaging to identify individual mouse receptor neurons, which fired on recognition of specific odors. The investigators exposed the neurons to a range smells. They found that a single receptor could identify several odors. At the same time, each odor was identified by several receptors. Different combinations of receptors fired to identify different odors. The olfactory subsystem recognized smells, when specific neuron receptor combinations fired. The olfactory circuit used an "alphabet" (A to Z) of receptors to identify a specific smell. Combinations of receptors (ABD, ABP, or XYZ), fired to indicate different smells. Subtle chemical differences caused distinct combinations to fire. This ability to recognize combinations reduced the number of receptor types (A to Z) required to identify a multitude of odors (the infinite vocabulary of A to Z combinations). In the experiment, scientists reported that even slight changes in chemical structure activated different combinations of receptors. Thus, octanol smelled like oranges, while the similar compound octanoic acid smelled like sweat. Remembering sweat smell is memory. Leslie Vosshall reports that, in her lab, ordinary volunteers, (not wine tasters or perfumers), could clearly distinguish between different combinations of 128 odor molecules, indicating an average human ability to differentiate between 1 trillion smells. Combinatorial coding provides massive human memory capacity. Dogs can quickly sniff a few footprints of a person and determine accurately which way the person is walking. The animal's nose can detect the relative odor strength difference between footprints only a few feet apart, to determine the direction of a trail. It was the same combinatorial coding, which enabled nerve cells of early reptilian nosebrains to recognize smells as safe, or dangerous. Myriad such judgments of the environment in cubic miles of codes support human memory. Odorant molecules reach the receptors in your nose, hitch on to a group of receptors, which recognize the odor. Calcium channels in the membranes of those cells open and calcium ions poured inside, generating electrical charges down the axons of those cells. You recognize a smell. Similarly, chemoreceptors in the tongue report molecules with information on taste. Other receptors are massed together to form sensory subsystems such as your eyes and ears. Human memory stores combinatorial signals generated by millions of similar receptors. Even the four "letters" in the genetic code – A, C, G and T – are used in combinations for the creation of a nearly infinite number of genetic sequences. Researchers discovered the “Bill Clinton neuron,” which fired on recognition of just one special face. The cell fired on recognizing three very different images of the former President; a line drawing of a laughing Clinton; a formal painting depicting him; and a photograph of him in a crowd. The cell remained mute when the patient viewed images of other politicians and celebrities. Scientists found similar cells in other patients, which selectively recognized Jennifer Anniston, Brad Pitt, and Halle Berry. Human memory assists in identification of people and places by remembering combinations in myriad neural recognition subsystems. Before the arrival of nerve cells, the earliest multicellular forms moved about and swallowed, or expelled food, by contracting their cells. The contraction was effected through chemical signals, the forerunners of hormones, which diffused quickly throughout the system. But the diffusion of chemicals was slow over longer distances and they could not be specifically targeted. Nature developed neurons to transmit specific information. Human memory comes from the ability of neurons to remember and recognize specific neuron firing combinations. The memories of computers are measured in terms of their smallest addressable element, called a byte. A byte usually contains eight binary digits. Nerve cells also have an “all or nothing” binary response. If combinatorial codes are remembered by nerve cells, each combination of firing inputs received by a neuron with 100 dendrites could contain 100 binary digits. The possible number of unique combinations of inputs for a single neuron with just 100 incoming dendrites could be computed as 100 x 99 x 98 x 97 x .... x 2 x 1 possibilities. That represents more than 1, 000, 000, 000, 000, 000, 000, 000, 000, 000, 000, 000, 000, 000, 000, 000, 000, 000, 000, 000, 000, 000, 000, 000, 000, 000, 000, 000, 000, 000, 000, 000, 000, 000, 000, 000, 000, 000, 000, 000, 000, 000, 000, 000, 000, 000, 000, 000, 000, 000, 000, 000, 000 unique possible combinations! Multiply that number by 100 and divide by 8 to measure the number of bytes of possible memory. A single nerve cell with 100 dendrites can potentially remember that many bytes of singular combinations. Some nerve cells have upto 2,50,000 dendrites! Only the possible existence of such codes can explain the phenomenal capacity of human memory. To get a proportion on human memory capacity, consider the estimates by science of the store of DNA codes in the human body. At the moment of conception, a single fertilized human egg contains information equivalent to about six billion chemical letters, which can be recorded in a thousand 500 page books. In a grown human body, with the DNA in each cell containing a sequence of over 3 billion chemical nucleotide bases, the total of those codes in the body would fill the 277 mile long Grand Canyon fifty times over with 500 page manuals! The memories stored by nature for programming life exceeds known computer capacities on an exponential scale. Karl Lashley reported that memory could not be isolated to any region of the cortex. He had taught rats to run complex mazes and then removed segments of the cortex to identify the locus of memory storage for the maze. He found that memory could not be completely obliterated by ablation of any specific region. Nerve cells were richly interlinked and code memories powered millions of interactive links. The memory of a location in a maze for a sought reward could still be remembered as an echo, or scent, even if the visual and taste regions were injured. Nerve cells in widespread neural circuits stored such coded memories. JUST THINK. What happens when you begin to talk? Your nervous system has picked an emotion. It has articulated an idea around it, chosen apt words, arranged them in lexical and grammatical order and adjusted the pitch of your voice. You've no idea what words you wii use. Who's actually in charge? You, or your nervous system? It was a sudden flash of light.... Way back in 1989. THIS is how we think! Our thoughts wander the universe, get angry, or smile. From memories, emotions and feelings that could fill vast libraries, THIS was how we focused on just THIS sentence THIS moment. A pattern recognition algorithm explained it! The idea hit me like a spark of light, while testing a Prolog AI disease recognition procedure on a Lotus spreadsheet. By mere chance, I had reversed the Expert System logic. For each symptom, instead of selecting all the probable diseases, I deleted all the unlikely ones. Reverse logic... Infinitely faster... Far fewer symptoms, instant recognition! Algorithms are merely repetitive procedures. But, this algorithmic code could still an ocean of thoughts to focus on THIS WORD. When you opened your eyes, your mind identified everything in your room. Identified the books and the shelves from complex patterns of light. Instant pattern recognition could explain so many mental activities. More probable things managed by pattern recognition kept waking me up at 3 a.m. The list kept on adding up in my diary. The dots just kept connecting. Patten recognition could make us weep in anguish or gasp in wonder. It could distinguish between good and evil. Was THIS the fabled divine gift of wisdom to life? The 1500 pages of Gray's Anatomy listed the functions of virtually every mental organ. Pattern recognition could link them all into a single mind that could suture an artery, while recalling a tennis match. Starting at the input level, it focused your senses. Millions of receptors flashed a magnificent perception of the world to the sensory regions of our cortex. In association regions, the algorithm identified every thing in your room. In just 20 ms. other regions could tell you that the door bell sounded happy. Object and event recognition. The limbic system could identify good happenings from bad ones. It generated emotions. This mammalian region could drive us to attack in anger, or flee in terror. It held us in thrall. Emotions caused the motor systems to trigger actions. Hunger made us raid the frig. We went to work daily to avoid the pain of guilt. Love reminded us to pick up children from school. Hatred built the death camps. In the end, urges from the limbic system drove us out of Eden. Sadly, we lacked the capacity to be consciously aware of our emotions and feelings. They were invisible to us. As a precious compensation, pattern recognition ascended higher. Our prefrontal regions gifted us science and logic. Those skills enabled us to understand the vast structures of the cosmos. We could sail the oceans, fly the skies and explore the heavens. 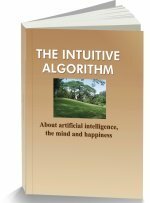 Even more, the algorithm also pointed to the divine, which defied logic and definition. We sensed the order and beauty, which, like the laws of nature, existed from the beginning of time. Pattern recognition dealt with subtleties. Great symphonies and works of art. Nerve cells valued such patterns without our awareness and fired to initiate the skin tingling thrill. Who, but the Designer, could possibly want to hard wire us to thrill to the astonishing splendor of the design? Over three decades have passed since my first glimpse of the vast and invisible city of the mind. THIS city has many avenues linking its great palaces and temples. Those divine pattern recognition paths also lead to still spaces, untrammelled by the ravages of emotions and feelings.... Stillness makes worth living! The great sages of the past advised the stilling of passions to empower the sublime within us. The divine stillness lives at the core. You too can live there. Even make it your home. 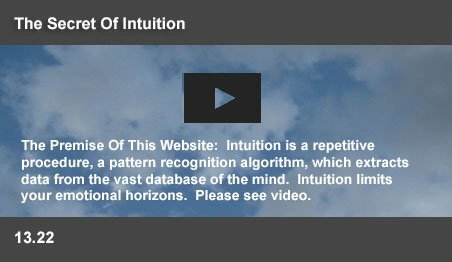 The information provided in this website is useful for the modification of normal behavioral patterns. Please do get professional help, before applying the advice for the treatment of any abnormal behaviors. Copyright ©2008 by Ebbi Thomas. All rights reserved. This material may be freely published, reproduced, broadcast, rewritten, or redistributed.